I didn’t know what tramping was before I got to New Zealand. I had come here to explore the outdoors but I didn’t know that would involve this thing called tramping. It had been 15 years since I’d last hiked with a backpack. 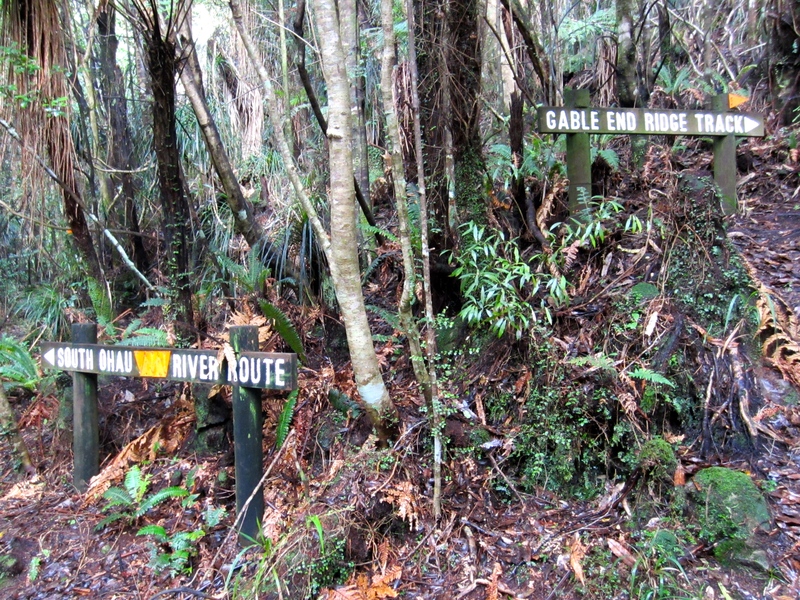 And I had no idea about NZ’s incredible network of backcountry huts that would become my destination on many a weekend. But after spending every other weekend in the outdoors one way or another for nine months, I have learnt a fair bit about the world of tramping. Here are my top lessons. And Gable End was a generous track gradient! After a month of day walks on the South Island, I felt fit and strong. My core strength was great, and a day walk with 1000m of ascent was easily within my grasp. However this tailed off faster than fast. And hiking up 1000m with a day pack and with overnight gear are worlds apart. So when it came to starting overnight trips I discovered my fitness not really up to scratch. But when I asked around as to what I could do to get fitter for tramping, a consistent answer came back: tramping. While general cardio fitness is vital for preventing fatigue, strong quads for hills and a strong core for stability, the only way you can built up the all-round stamina you need for tramping is by doing it. It is totally possible to tramp with no fancy gear, so long as you have decent boots. There is a world of retail experience waiting for you if you want, but the only really vital piece of kit is good boots. That said, incremental improvements to your gear above that will make every little part of your experience a little bit more pleasurable. A proper waterproof, so that you can be confident that when a downpour comes you will stay dry for a while at least. Merino wool clothes so that you know if your clothes are wet, you will stay warm, and if you build up some body heat you will retain it. (‘Cotton is your enemy’ is a familiar phrase. I feel sorry for cotton, it does get a bad rep. But when I accidentally brought my cotton leggings instead of Icebreaker Merino ones to Dundas hut in the winter at 1400m, I really was convinced that it is true). A sleeping bag that will allow for a full night’s sleep at zero degrees, even if the fire doesn’t get going in the hut (as was the case at Waitewaewae Hut in the Tararuas in July, when the air was too cold and the wood to damp to get any fire). Hut shoes so that your feet stay a decent temperature and dry. A head torch that’s bright enough to stop you from tripping up on tree roots. A waterproof emergency bivvy bag in case things go wrong on the way. When I first went on an overnight trip in February my bag was the lightest in the van, so diligently had I stuck to the tramping club’s excellent gear list. But slowly, one piece at a time, I have upgraded my kit. Sometimes upgrading makes things lighter, such as my down sleeping bag. But often it makes things heavier. Breaking my toothbrush in half hasn’t really compensated for the extra weight I carry from the upgrades. And I now have to fight to keep my tramping friends from being seen with me since I bought Crocs as hut shoes (but oh boy, are they the most comfortable shoes I have ever worn). 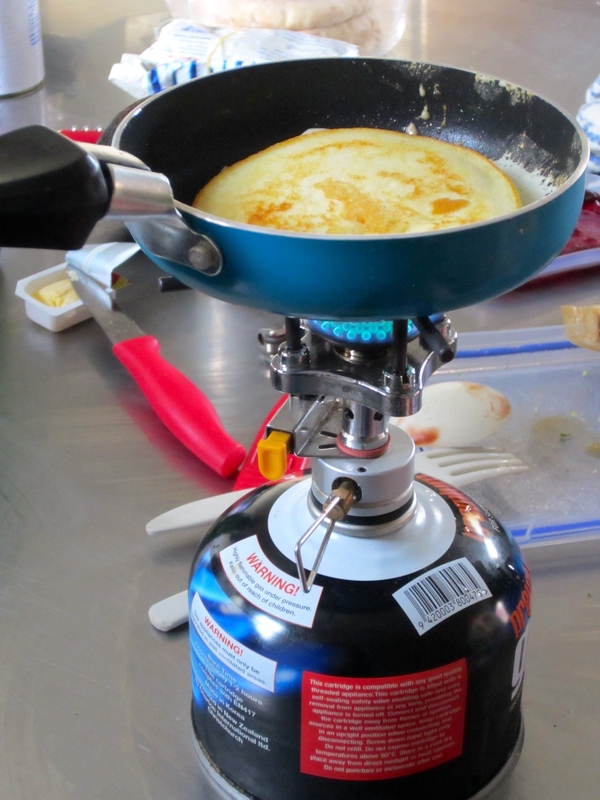 Tiny pancake pan: essential kit. But there comes a point where it gets a bit silly. Really your enjoyment of the trip won’t rest on your pack being a tiny bit better fitting, your roll mat a little more cushiony or your gloves waterproof a tiny bit longer. Ultimately carrying all your stuff on your back is going to be tiring, sleeping on bumpy ground is uncomfortable, and in heavy rain the water will eventually make it through whatever you are wearing. So I resist the urge to move to a water bladder over reusing plastic bottles (there is always time to take a rest to have a drink, plus it means you can have a rest!) and I resist the peer pressure to acquire a down jacket, the latest fad. (This baffles me. Has no-one remembered how much we disapproved of puffa jackets in the late 1990s?) My cheap fleece will do alright 95% of the time. And for the remaining 5%, I will borrow your jacket. I gave up on the kilometer-o-meter on the blog a few months ago, when I realised that there wasn’t really a relationship between how hard the trip was and how far the distance was. Many people – including me to begin with – find the DOC website frustrating because it doesn’t list how far a track is in kilometres, nor the altitude, instead they just how long they anticipate it will take. But the reality is that this is the better guide. Or at least times taken by a person similar to you are the better guide. The timings suggested by DOC are a starting point but are not consistently accurate for average speeds. I find I am normally between a little and a lot faster on flat or uphill, and about what DOC say on the downhill. But the best way to find out how long a trip will take is to study the map properly: contour lines are for counting. I rarely do this and I always regret it, such as when we failed to make it anywhere near Mitre despite having a whole long weekend, thanks to having underestimated how long it would take and how tiring it would be to get to Cow Creek Hut. 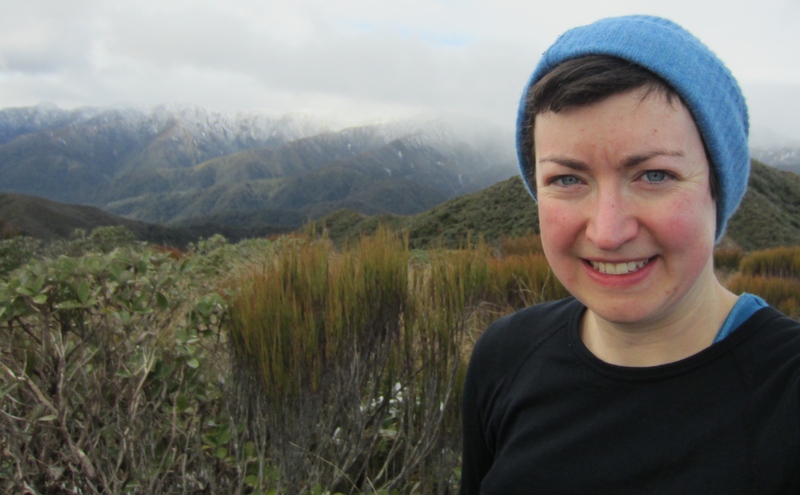 Every kiwi tramper wears shorts and gaiters, whatever the terrain and weather. At first I was unconvinced, suspecting this was just the case because people enjoyed the feeling of wearing knee-high boots and this was an outdoor way to emulate it, acceptable for both men and women. While this may still be true, finally I conceded, and I love it! The shorts make your legs feel freer and keep you from overheating. The gaiters keep your legs warm, prevent water from getting in your boots, and limit the scratches on your legs. For my first river crossing, at Lake Rotoiti in Nelson Lakes, I was warned by my hostel host about this in advance and told to bring jandals (flip flops). But as an aside, he said ‘kiwis don’t care, they just keep their boots on’. This seemed very strange to me. Having not seen people walk straight through rivers boots ‘n’ all before, I wasn’t sure whether this was true. So for my first river crossing, I took my boots off and tiptoed across in my flip flops. It probably added 20 minutes of faff to my nine hour walk. The second time I tried to do this, my flip flops broke, and I ended up trekking between the five crossings with one foot bare. Since then, I keep my boots on. There’s usually another crossing just round the corner, so if you have to keep taking them off, you waste an unfeasible amount of time. And if the water’s low, your gaiters will protect you unless you faff about being tentative on stepping stones, as I do. If the water’s high or you are me, your boots get filled with water but your feet keep them warm and after a while you forget about it. If you’re lucky they dry out overnight. At first I tried to hold back on the snacking – not wanting to accidentally overdo it on the fruit and nuts and spoil the effect of burning up twice the normal daily calories. This proved a mistake – with no fuel the tramp is deeply unpleasant, every step becoming harder than the previous, especially on the uphills. Then I started bringing more food, but still stuck to the idea of stopping for a big lunch and trying to keep main intake to that point. That was until the Harris Shelter mistake, where I discovered that eating when cold diverts blood to the gut, leaving me feeling freezing and unbelievably nauseous. So now I try to spread my food more evenly during the day, pretty much splitting my lunch into two sittings. The best source of advice about the condition of the track, weather on the tops and distance from the hut are the trampers coming down the track in the other direction. But counting on that would be foolish, so there’s a great number of kindly bloggers writing trip reports that help with this sort of thing. 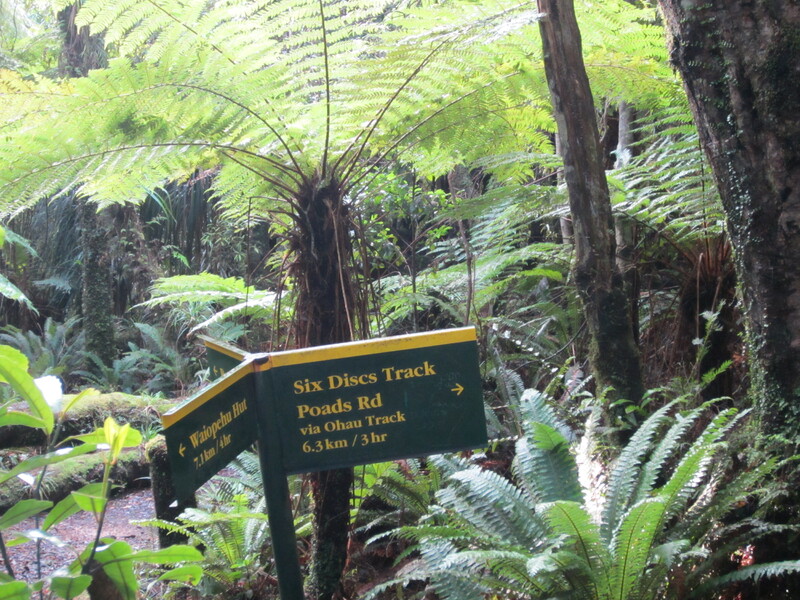 Tramping club newsletter archives are great too (Wellington Tramping and Mountaineering Club, Palmerston North Tramping Club) and you can usually search by track or hut. Cross-checking those reports with the DOC website to check that tracks and huts are not closed due to slips or flooding is wise too. Now I realise that much of the pleasure for me comes from not being able to do anything else. A day or two or more of not being able to obsess about productivity. And therefore being able to relax into just doing this. I never did read the book on mindfulness that I brought with me, but I do think tramping is a particularly mindful activity. If travelling across difficult ground, or walking alone far from civilisation, you have to be mindful or you will trip up and put yourself in a difficult or potentially dangerous situation. Last weekend my head was cloudy and messy and I was longing for escape. After two seven-hour days my body was achey but my mind was clearer and calmer than it had been for ages. After three hours of uphill forest tracks on Saturday, I was tired and my energy waning, until suddenly the bush opened up to wonderful views across the Wairarapa. And then I remembered this was why I had come. The next day we had the most gorgeous views of the path I had travelled on the Dundas Hut trip, but this time sparkling with snow and ice. The jury is still out for me on whether I want to start alpine tramping (snow) – I’m unsure about whether it’s right to bring this extra level of risk into my life now that I know a bit more about avalanches. Plus they bring a whole heap of extra faff – managing the gear, route finding and assessing weather conditions are a whole new set of skills, let alone anything more serious involving ropes and technical climbing. But there is no doubt that views of snowy landscapes, taken amongst them, are the ultimate high in tramping. 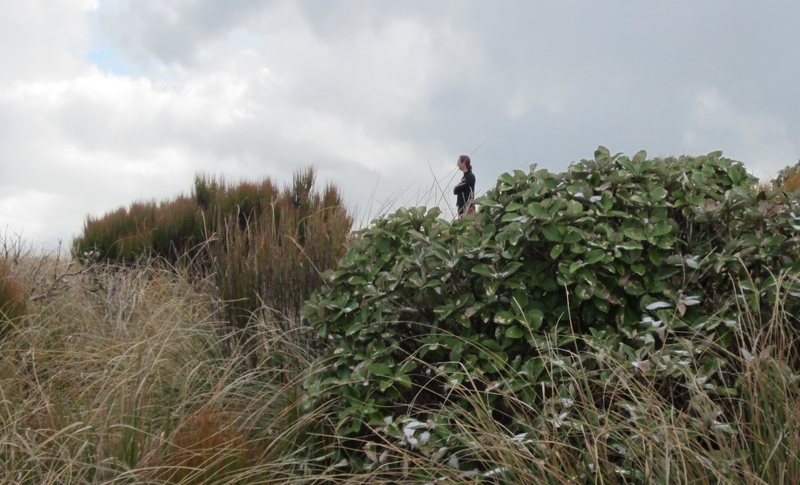 When I get back to New Zealand it will be Spring – longer days beckon and warmer nights too. To the South Island here I come. overnight trip to Waitewaewae Hut. On Saturday we took the new track – five hours and surprisingly hard (guess who didn’t count the contours – it was an undulating day). Saturday night was cold as the fire wouldn’t light. On Sunday we went up the mountain for a couple of hours and then walked out via the old track, which took a bit less than five hours. This was mainly descending via a stream, which was really fun, but there were some dodgy sections near the slip that has caused the track diversion so I wouldn’t take this route again. 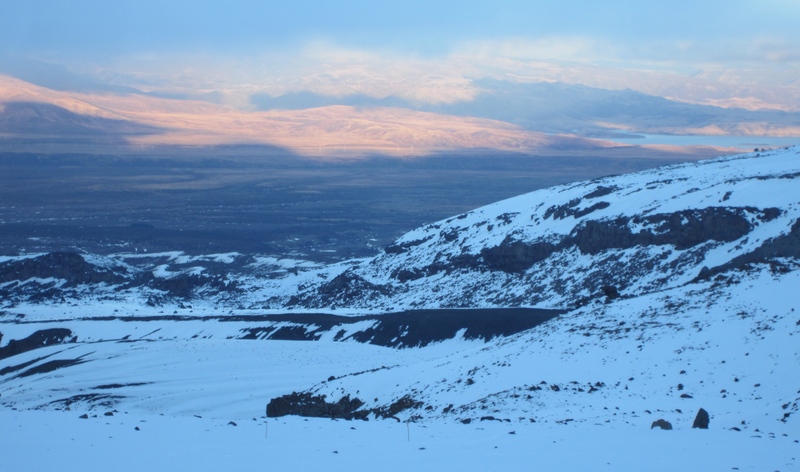 New Zealand Alpine Club Intro to Snowcraft course on Ruapehu. We learnt how to walk efficiently in snow with and without crampons, how to front-point up and down steeper slopes, how to self-arrest and how to rescue an avalanche victim using a transceiver, probe and shovel. We even practised the shovelling. 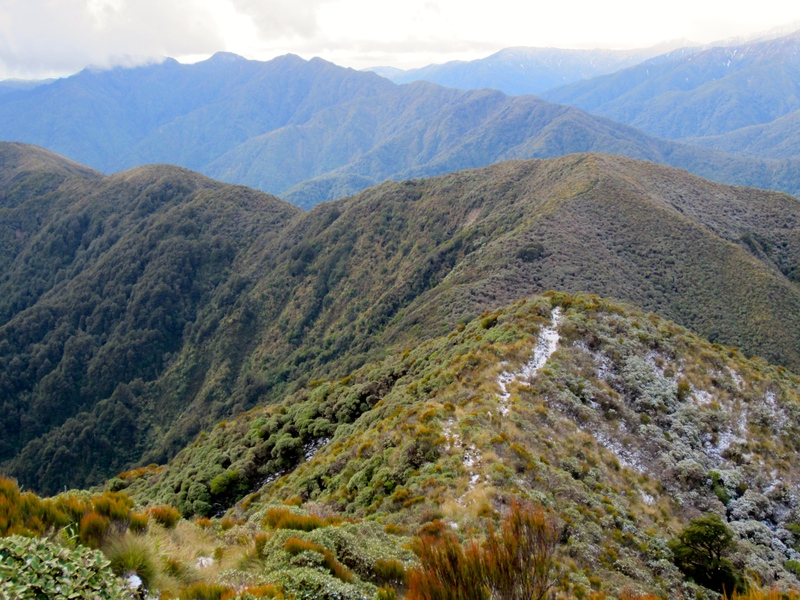 overnight trip from Poads Road to Te Matawai Hut via Gable End Ridge, returning via Waiopehu Hut. This was a brilliant trip – seven hour days and total climb of about 900m ish but very well graded making for an easy trip. Beautiful views, particularly the morning section from Te Matawai to Waiopehu. 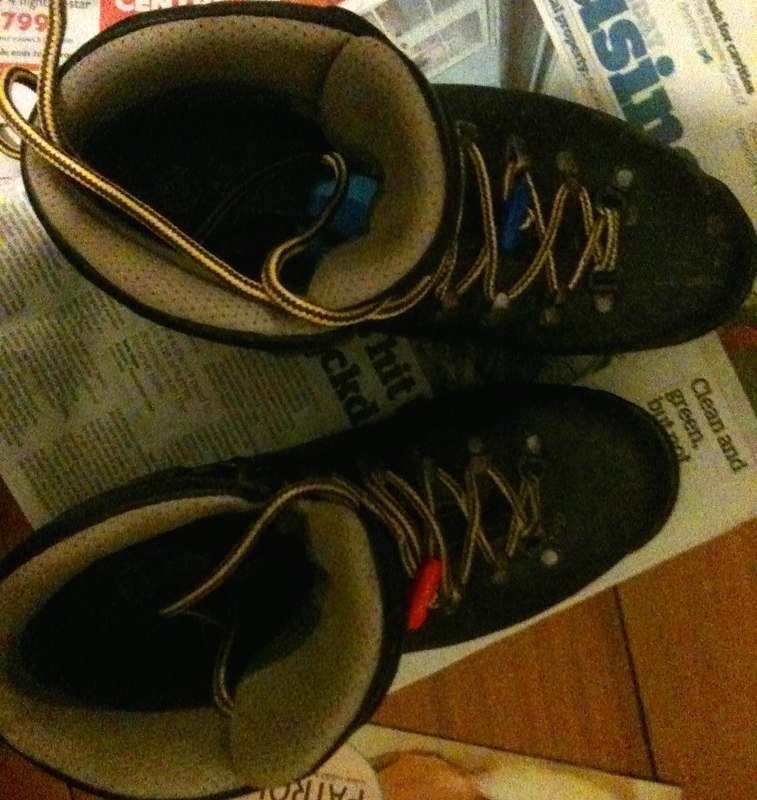 Posted in UncategorizedTagged alpine, gear, New Zealand, snowcraft, Tararuas, trampingBookmark the permalink.